Moeraki, is a small sleepy fishing village, some 70km north of Dunedin and 30km south of Oamaru and means "a place to rest by day". 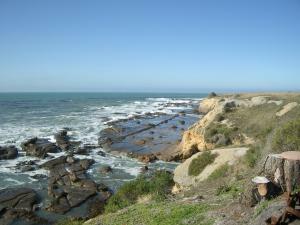 The area has a rich Maori, whaling and sealing history. It's famous for the beach with perfectly rounded boulders, millions of years old, - The Moeraki boulders. The yellow eye and blue penguin colonies, sea birds and seals can bee seen resting on the rocks alongside the Moeraki Lighthouse (1878). Take a few days and relax at a variety of accommodation available in the village and nearby area.